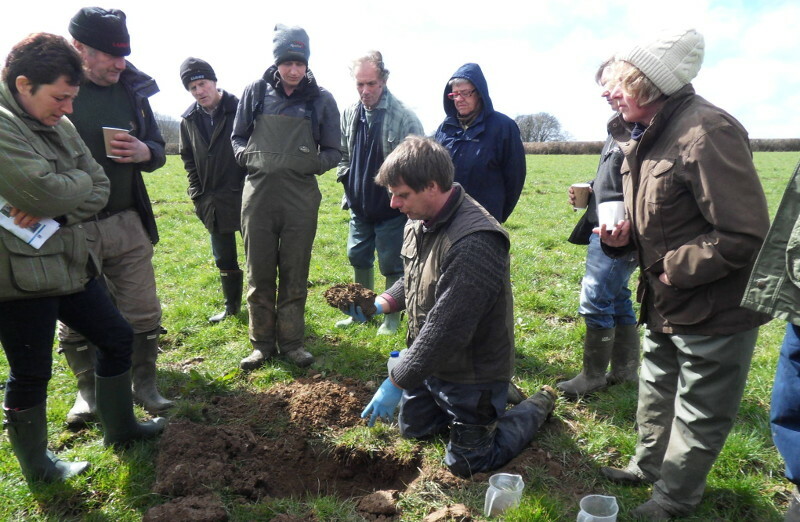 20 farmers this week from the Tavy and Tamar catchments got together at Hurlditch Farm, Lamerton near Tavistock to exchange information about grassland and soil management to maximise profitability and improve water quality in the river. Tony and Jenny Boon of Hurlditch Farm kindly hosted the “Soils Alive” event which was organised by Martin Harmer of the Westcountry Rivers Trust leading the 3Rivers Water Environment Improvement Fund initiative with the Environment Agency. The event was also supported by the AHDB (Agriculture & Horticultural Development Board). The guest speaker for the day was ruminant nutritionist and grassland specialist Luppo Diepenbroek, who engaged the farmers with practical tips and advice for improving productivity such as resting the soil adequately between grazing, encouraging worms and nutrient uptake with applications of lime to raise soil PH, and including herbs and legumes in the sward for their soil structuring capabilities. This helps retain nutrients in the soil and reduce erosion and run-off.